I have to take this week off so that I can put my time and effort into something even more fun than making food for my blog: my youngest sister’s wedding! She is getting married to her very own beloved this Friday and I am helping my mom with the food for the wedding as well as dinner later that night for the family that is visiting for this wonderful event. With all of the huge things in limbo in our family right now I just can’t do the wedding food and the blog post I had in mind this week in addition to everything else. Things would go badly. So I decided that the blog post can wait, it’s the least important- I’ll only get the opportunity to help with my sister’s wedding once! I couldn’t leave you with no recipe at all this week though. 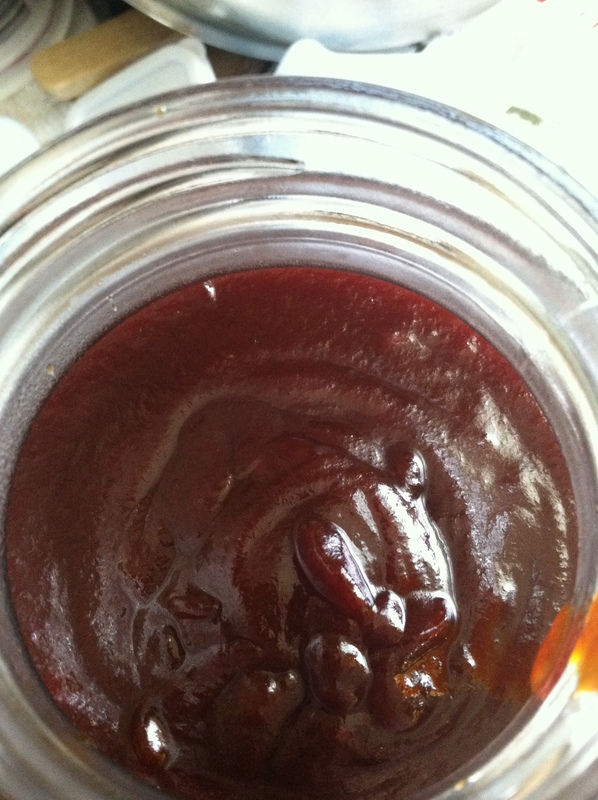 One of the things I will be making this week is a huge batch of my BBQ Sauce that I will be canning as well as using for Saturday night’s dinner. Sweet, smoky, a tiny bit spicy… It’s perfect for the BBQ beef I’m making or anything you could be putting on the grill this weekend! 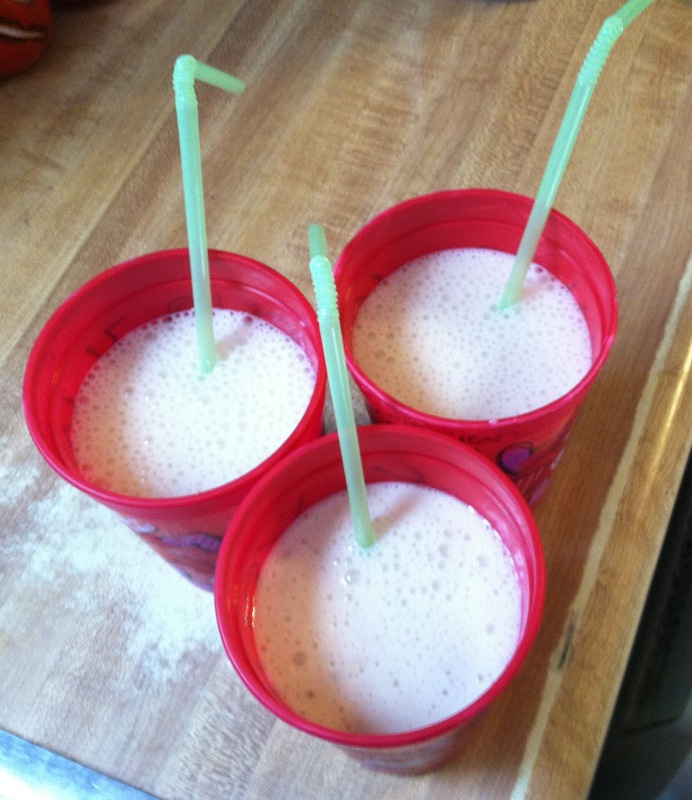 Drinkable yogurt is a very personal thing and can be made at home according to your personal taste so this will be more of a method post instead of a recipe post. Do you want thick, tangy, almost UNdrinkable yogurt? Then use very little milk or juice and extra fruit. Would you prefer a nearly imperceptible yogurt flavor and a consistency that will easily be drinkable from a to go cup? Then use more liquid as well as fruits that puree easily in the blender (like bananas and strawberries). This differs from a smoothie in that you don’t add any solid things like chocolate chips, crushed cookies, oatmeal, ice, or the like. This is just straight yogurt, liquid, and fruit (if desired). So if you’re looking for something that will fill you up and be all that you have for breakfast this will probably disappoint- you should go with a smoothie. But if you want something light and/or something that will go along with, say, a granola bar then this is for you! 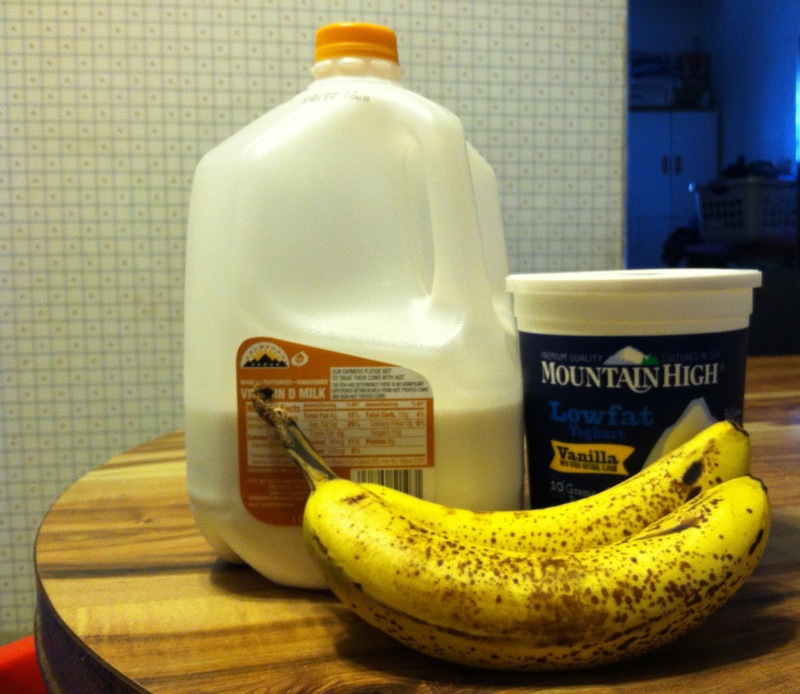 If you don’t want to use milk you can substitute fruit juice of some kind. Pretty much any juice works- it just depends on what you want the finished product to taste like. My kids & I are very partial to pineapple juice with the banana to make a very tropical drink but as I didn’t get any from the store this trip, I’m using milk. Apple juice will give you a nice, fairly neutral flavor, and orange juice will give you an almost Orange Julius type drink. And if you want to use plain yogurt that’s fine too. Use whatever you’d prefer for all of the ingredients- that’s what makes this so easy! Unfortunately I can’t give you a whole lot in the way of measurements. I’ll try to give you good pictures of the side of the blender so that you can see about how much I use to make enough for the kids to have about 6-8 ounces apiece. *Blend all ingredients together until drinkable. 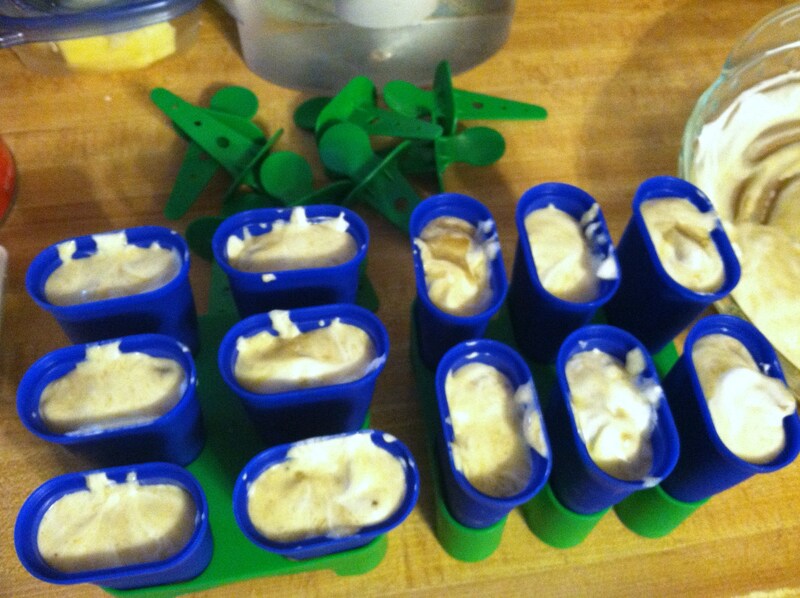 I bought something recently that I’d been wanting to buy for several years now and kept putting off: popsicle molds. I’ve seen SO many recipes in various places for popsicles and said “Oh I wish I had popsicle molds- that would be so tasty and fun!” But every time I had the extra bit of money it went to something else that was needed. That, and I’ve never been keen on having to buy popsicle sticks all the time. So when I would find a set of molds for a reasonable price it would invariably be a kind that required sticks to be purchased separately. But this summer I’ve been striving to make cooking and eating more enjoyable despite the heat and I decided that this was the year I was going to really do some research and find some popsicle molds I would be happy with. So I went to Amazon.com (where we buy pretty much everything but clothes and food) and started looking. 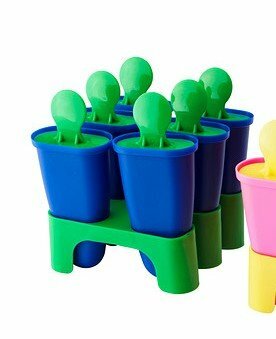 I found the perfect molds and bought two sets; as we have 5 in our family and need more than 6 popsicles at a time. I spent less than $15 and got 2 sets of exceptionally sturdy molds from Ikea. Boy, have I become the coolest mom in the world! See, as it turns out, the easiest popsicles in the world are just a bottle of fruit juice away! You can use the same bottle of juice you had with breakfast and have healthy popsicles after dinner! The kids were astonished 🙂 I chose a 100% juice berry medley and put that into the molds the very day I received them in the mail (after a thorough washing, of course) and the kids were ecstatic at the thought of making our own popsicles out of pretty much anything we wanted. They started coming up with all kinds of ideas for things to make popsicles with. But they stood in awe of their favorite cook when I told them that we could make popsicles out of my homemade pudding. I was born in 1979, so I was able to enjoy the original Jell-O Pudding Pops. Anyone 30 or over will remember Bill Cosby hawking Jell-O’s creamy, super tasty popsicles and savoring the amazing taste and texture of those little frozen gems. Then they disappeared without warning and the freezer section of the grocery store was a slightly sadder place for it. Fast forward a decade or so and Jell-O tried to bring back the pops we all knew and loved and get a new generation hooked. It worked great: there were people all over the place doing double takes in the freezer section (literally! Not only was I one of them but I actually saw several other people do the same! ), then rushing to grab a box and introduce their kids/grandkids/nieces/nephews to them before they disappeared again. Then we all tried them… they were a vile mockery of the pops we had loved so much! Grainy from ice crystals and slightly chalky, they had an incredibly off-putting flavor that made me throw most of the box away uneaten. It was a very saddening experience. Fast forward a bit more to the present. I made a double batch of my amazingly yummy banana pudding. We ate half of the batch for dessert after dinner and the other half got stirred together a bit and put into the newly purchased popsicle molds. What came out of those molds was nothing short of nostalgia-inducing bliss! The pudding was smooth and creamy, the whipped cream even more so, and the little pockets of vanilla wafer were a wonderful treat to bite into- even if they didn’t strictly keep with the classic pudding pop theme. The only problem was the chunks of frozen banana. They added fantastic flavor, but they were the one discordant note in a symphony of creaminess. They froze just a little too hard and the texture just didn’t fit with the rest of the popsicle. 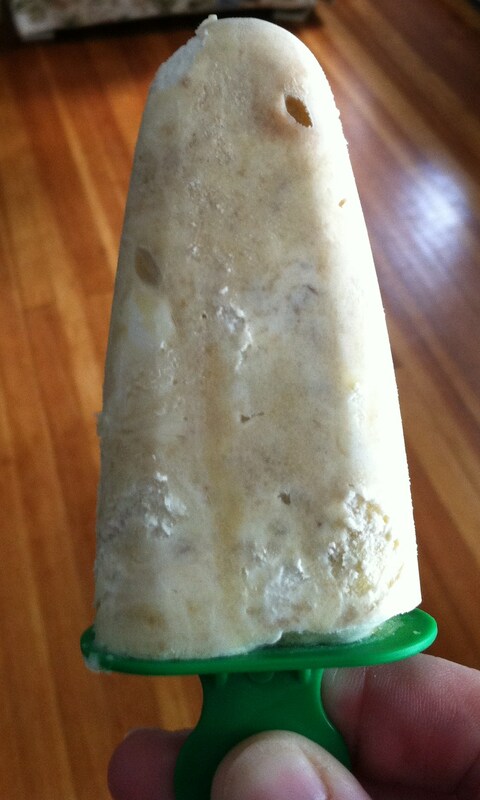 Other than the chunks of banana and the bits of vanilla wafer, these were remarkably similar to Jell-O’s Pudding Pops! The bites that didn’t have chunks of things definitely had the taste and mouthfeel of those original little wonders from the 80’s. I do believe I’ve done it! Yay me! First, make your pudding. 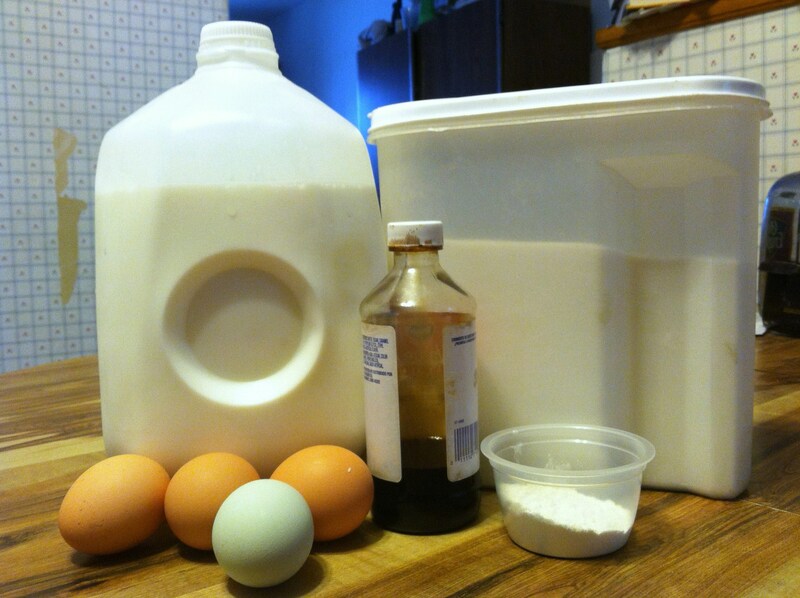 All you need for homemade pudding is milk, sugar, flour (you can use cornstarch, but the amount will differ), eggs, flavoring, and a pinch of (sadly not pictured) salt. Now, about the eggs: you only need part of them; the yolks. To separate the eggs you can either a) crack the egg on the counter, carefully pry it apart at the equator, and use each half as a little cup to transfer the yolk back and forth as the white falls away into a bowl underneath, b) crack the egg as before and pour it out into your hand held over a bowl with your fingers apart a tiny bit to let the white fall through, or c) go buy an egg separator. I disdain egg separators. They only thing they are good for is separating eggs. And what happens when you leave the separator near the stove and it melts? Then you have to use either option a) or b) and you could have saved yourself the money and done that in the first place! Using a gravy ladle or spoon (the gravy ladle is PERFECT for this job though!) in your off hand- for me it’s my left- take up a small amount of the hot mixture. With your dominant hand- the right for me- start whisking the egg yolks as quickly as you can manage with one hand. It doesn’t have to be fast- you just need to keep them moving. 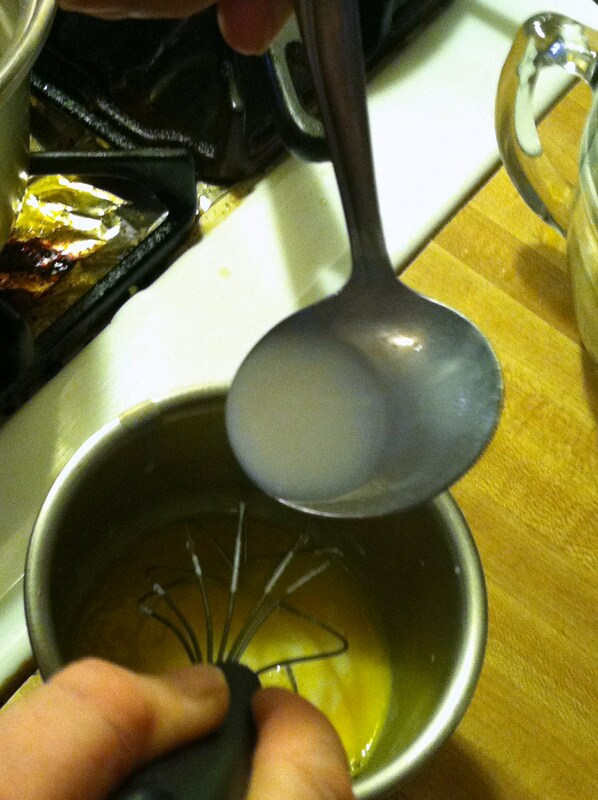 Now slowly pour the mixture from the ladle into the yolks, whisking the whole time. Keep the whisk moving! That’s what prevents the eggs from scrambling. 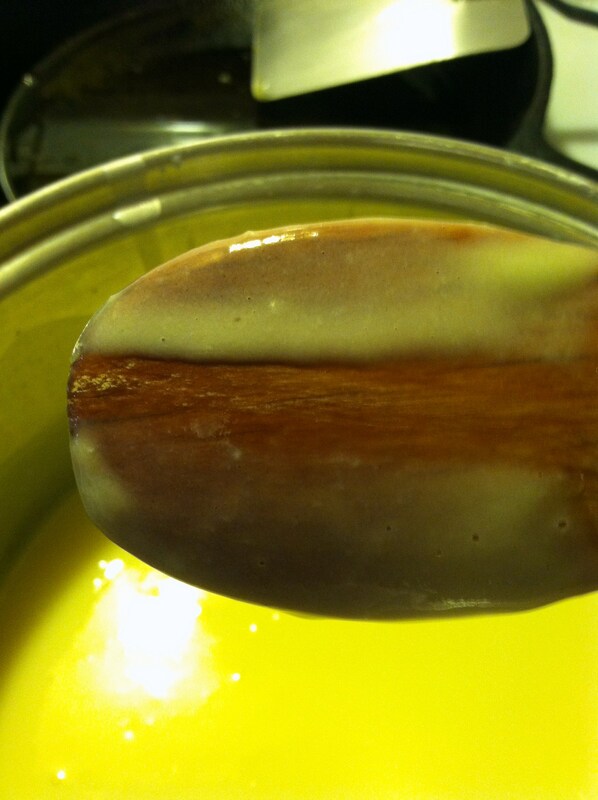 See how the pudding stays nice and thick on either side of the line and doesn’t run? That is exactly what you want. Personally I will cook the pudding an additional 2 minutes after this point because I like a nice, THICK pudding- especially if I’m layering it for a dessert. My bananas are a bit darker than they should be because I had to freeze them. It would be best to use freshly mashed banana because it has less liquid. When I stirred the pudding with the whipped cream the cookies were almost liquified. Not very pretty to look at but tasty nonetheless! Put this in the refrigerator until thoroughly chilled- overnight is best. 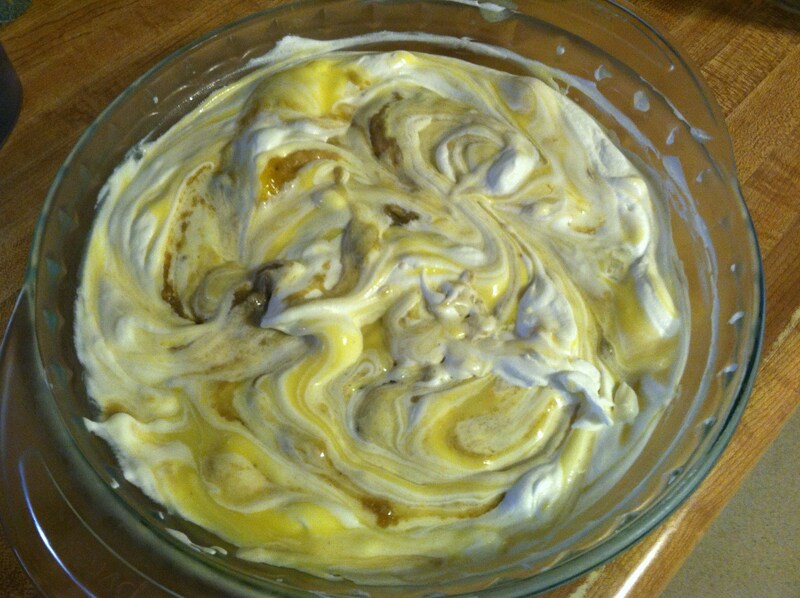 After the pudding base has chilled completely you can make the whipped cream. Yes; you COULD just buy some Cool Whip & call it good. But Cool Whip counts as food only in the sense that it’s something you can ingest without dying. It is chock full of chemicals that are rather horrifying, really. Do yourself a favor and make your own whipped cream. Heavy whipping cream and sugar is all you need. You can add a little vanilla if you want, but I don’t here because the pudding has plenty. But homemade vanilla whipped cream can truly be a dessert all it’s own. My kids LOVE it when I give them a small dish of it for dessert. It’s a great treat indeed! When making whipped cream your utensils need to be ice cold- literally. 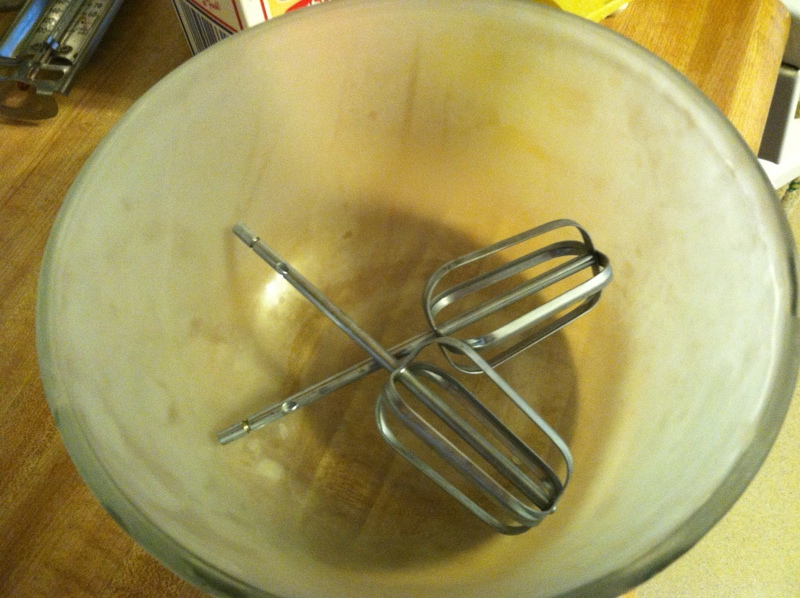 Whether you do this with a hand mixer or in a stand mixer the bowl and whisk attachment(s) need to be put in the freezer about 20 minutes before you actually whip the cream. And you really do need to use a glass or metal bowl for this- plastic WILL NOT hold the cold in long enough to be useful. Do your bowl & attachments look like this when you take them out of the freezer and the room temperature air hits them? See the waves from the mixer? They should stay like that even after you’ve stopped mixing and there should be little peaks that stand up (stiff peaks). It will also start to take on a slight yellow hue. 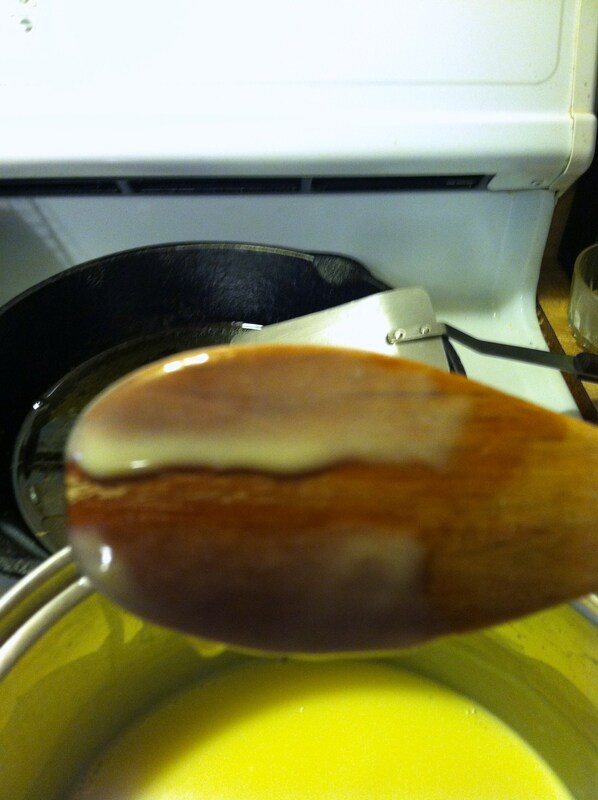 That is the cream going from whipping cream to butter (you did know that butter is made from cream, right?!) Once the cream is stiff and just slightly yellow stop mixing or you will, indeed, end up with butter and you’ll have to start over again. But you’ll have some very tasty butter to drain and use! Only 6 more weeks of summer left! I think I can hold on that long! Actually, we’ve been having a fairly good summer this year so I can’t complain too terribly much. We’ve had so much rain that the severe fire restrictions that were put into place shortly before Independence Day have been lifted, and we should have a major cool down here in Northern Colorado over the next few days. I’m still ready for summer to be over and Autumn to arrive though!! *Mix sugar, flour, and salt in a heavy bottomed sauce pan. *Add milk, and whisk over medium low heat. *Temper the yolks as above, then add them into the pan. 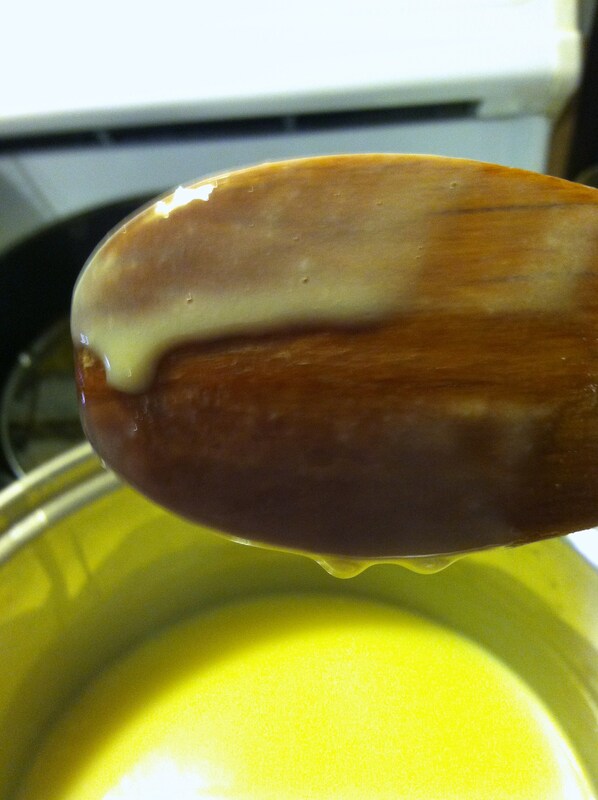 *Cook over low heat, stirring constantly, until custard coats the spoon as described above. *Remove from heat and add vanilla extract and nutmeg (if you want to use the nutmeg). *If all you want is vanilla pudding, transfer pudding to a bowl, place plastic wrap directly over the top of the pudding, and chill completely. 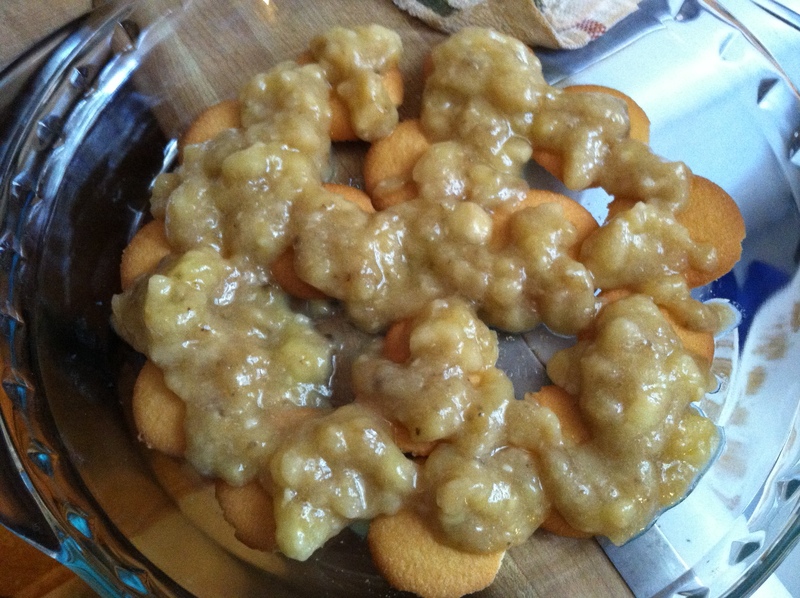 *If making banana pudding, place the vanilla wafer cookies and the bananas in layers into a serving dish with the cookies on the bottom- a 9 inch pie plate works perfectly- then pour the hot pudding over the fruit and cookies, place plastic wrap directly onto the surface of the pudding, and chill completely. 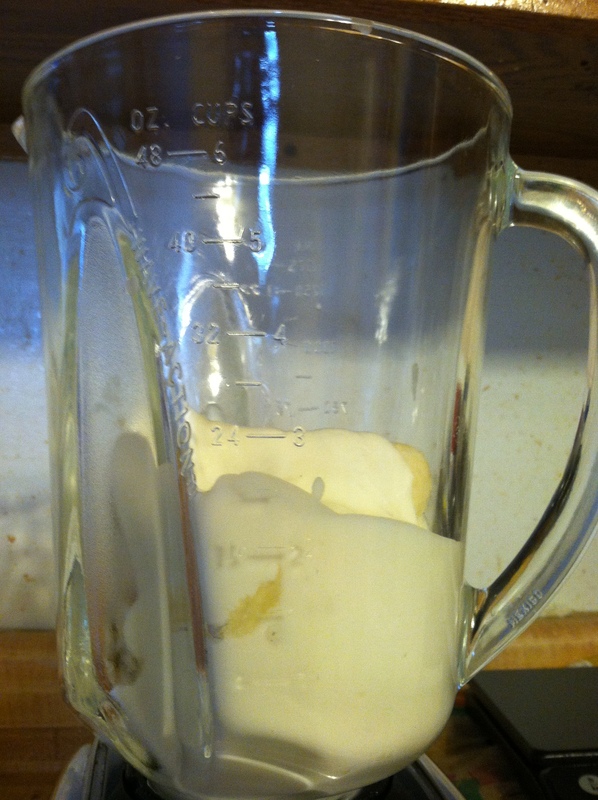 *Chill the glass or metal bowl you’ll be using in the freezer for at least 20 minutes prior to whipping your cream. 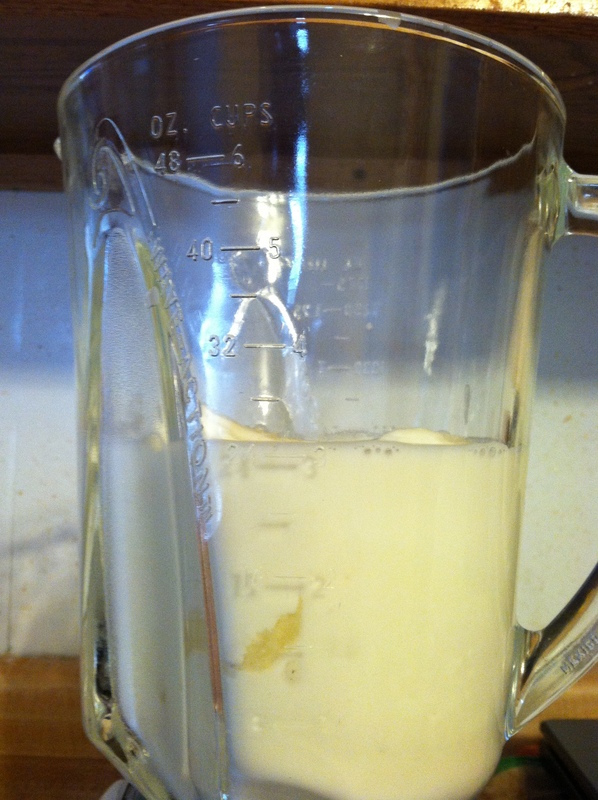 *Pour the cream and half of the sugar into the bowl and start mixing on medium speed. *Once the cream doubles in volume, add the rest of the sugar. 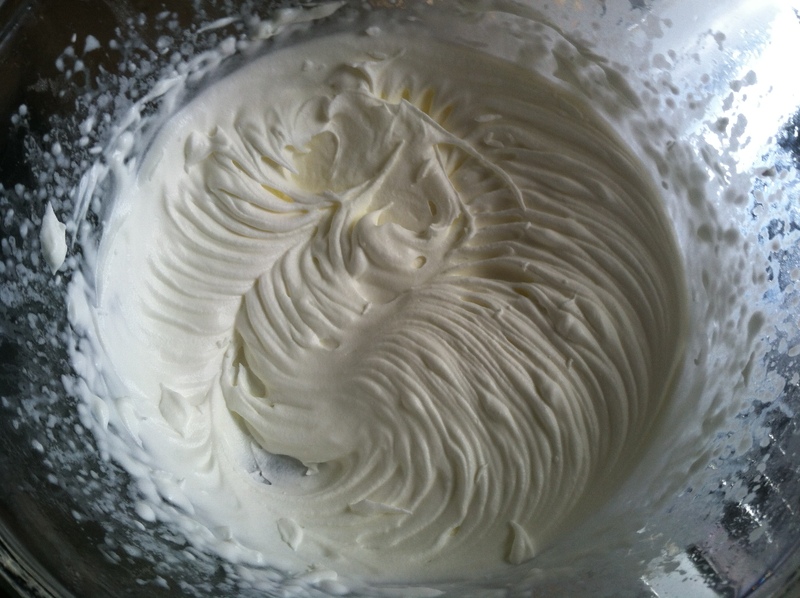 *Continue mixing at medium speed until the cream is very thick and forms stiff peaks. 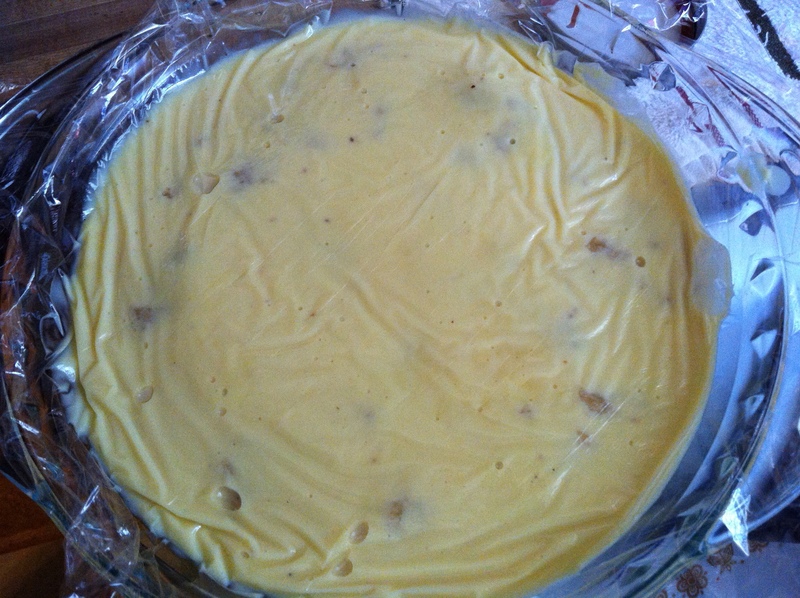 *Spread over the banana pudding base or use as desired.